Malmö New Stadium also known as the Swedbank Stadion for reasons of sponsorship, is the purpose built football ground of Sweden’s most successful team, Malmö Fotbollförening, First opened in 2009, the €79.7 million construction project has a capacity of 24,000 – the third largest in the league. Malmö began to seek a move away from their former stadium back in the mid 1990s as their former ground proved to be large for the average crowd size and combined with the maintenance costs of the ageing structure, it was slowly becoming economically unenviable. 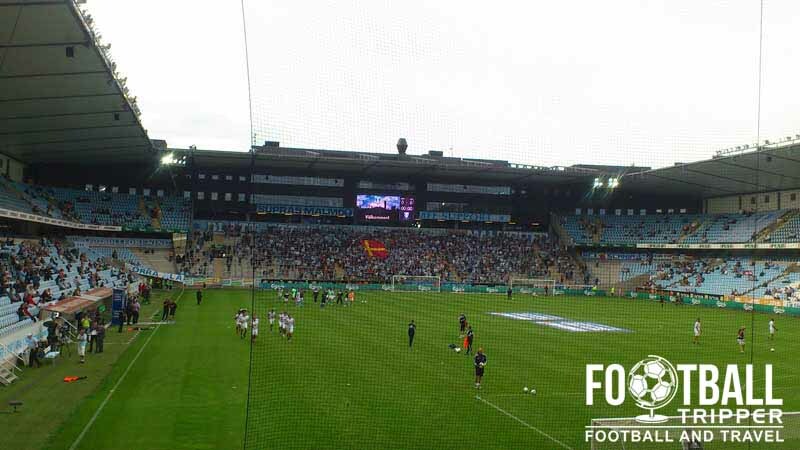 The board initially believed that relocating to the club’s even older stadium, the 1910 built Malmö IP, was the answer, but this proved to be a short term solution with the club returning to Malmö Stadion in 2001. 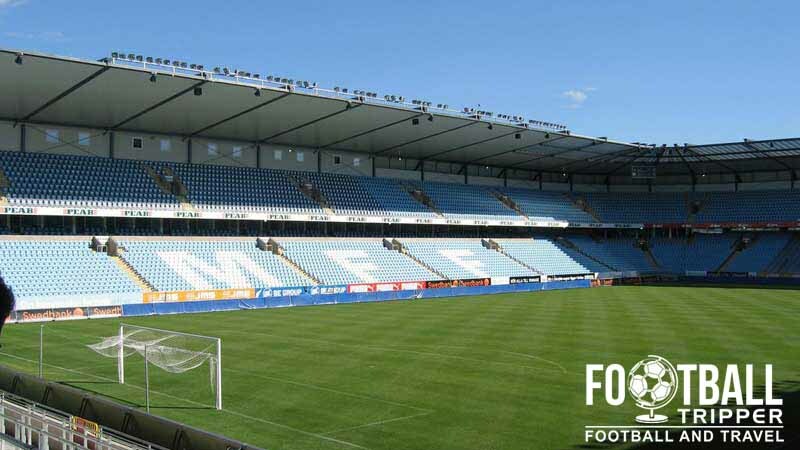 After winning the Allsvenskan title in 2004, the first time in over 25 years, the club began to once again flirt with the idea of building a brand new stadium and in conjunction with Malmö Municipality they drafted five different locations. Option 3 was eventually chosen which would see the current Malmö Stadion renovated into an athletics stadium, and a purpose built football ground built to the south. The 24,000 capacity stadium which includes 18,000 seats and 6,000 terrace places is the third largest to be used in the Allsvenskan behind AIK’s Friends Arena and Tele2 Arena shared by Djurgårdens IF’s and Hammarby IF. Costing around €79.7 million euros the project’s initial budget of 398 million kronor almost doubled, with the club opting to sell the naming rights to Swedish Bank Swedbank for a ten year period to help cover the miscalculated costs. The inaugural match was held against division 1 side Örgryte IS on the 13th April 2009 with Malmö FF ushering in the new era with a 3-0 nil victory. The record attendance at the ground so far is 24,148 which was set during the last game of the 2010 season against Mjällby AIF, when fans watched the team secure the league title. 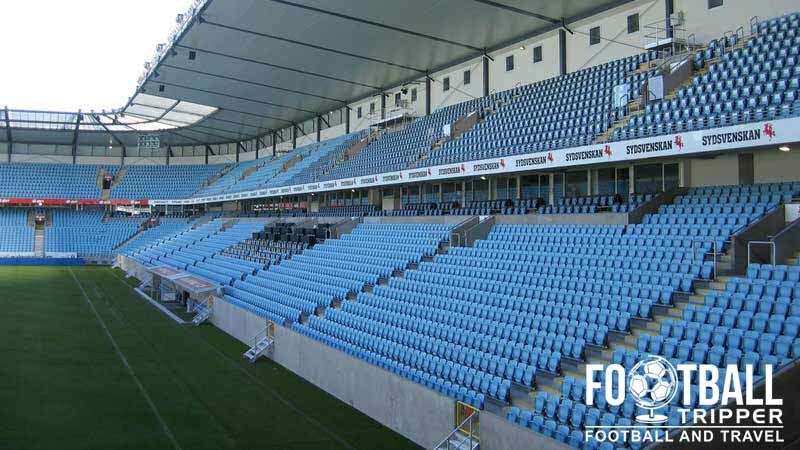 Allowing Malmö FF to compete in the Champions League, the capacity of Swedbank Stadion is reduced to 21,000 as the 6,000 terrace places are converted into seats as per UEFA regulations. Malmö Stadium is comprised of four stands: North, East, South and West. Away fans are housed within the south stand, and the standard allocation of 600 tickets are usually distributed within section 17. Accessible via Gate E, the away section can increase in size depending how large the travelling contingent is expected to be. For European matches for examples where UEFA generally encourage a minimum 5% of tickets rule, you’re looking at around 1,050 tickets for the travelling supporters. A look at the exterior of the main stand, and the entrances to the central seating area. There are over 24 food and beverage kiosks dotted around the stadium ranging from coffee to candy ones, and fast food to those dedicated to being healthy! Predictably you will find the highest density of bars within the city centre and less as you get closer to Swedbank Stadion. The neighbourhoods of Lugnet and Möllevången have a surprising amount of eating and drinking options. Malmo FF operate a club shop at the stadium in addition to their very own web shop which is open 24 hours a day. The stadiums club shop is guaranteed to be open for at least 3 hours before kick-off on Sundays, and for a short while after the full time whistle. 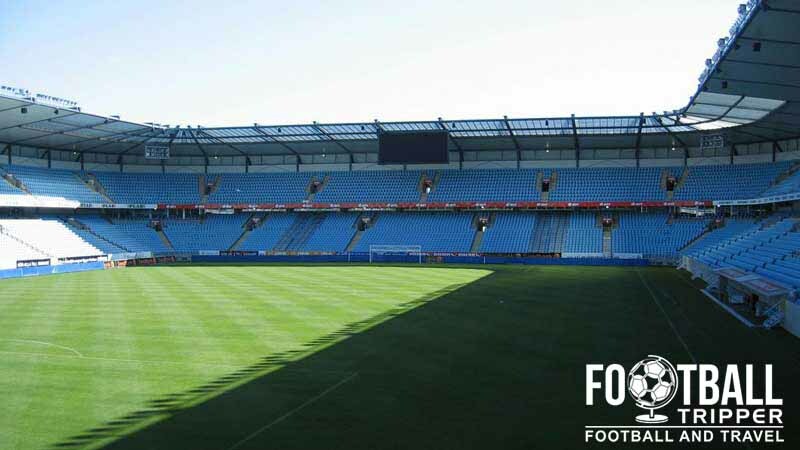 Stadium tours of Malmo’s Swedbank Stadion are by appointment only and are designed for groups between 15 and 25. Sadly this means that for most football trippers the stadium tour isn’t suitable. You could always try asking if someone will give you a quick tour by phoning the office on 040-326638 or sending an email to [email protected] There are however no guarantees that this will work! A relatively “arty” shot of the sign outside Malmo’s club shop with the logo for “Swedbank Stadion” just about creeping in. 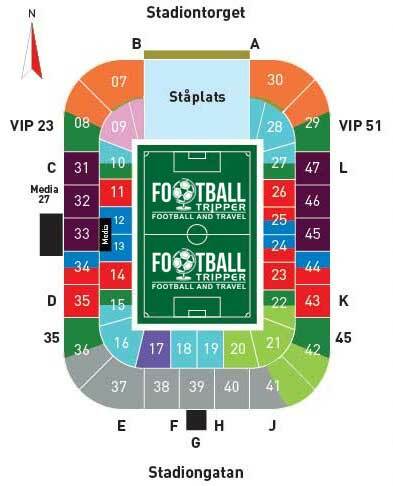 Tickets to see Malmo FF play at home can be purchased via the usual channels including online, by phoning the box office on 077-170 70 70 between 9.00 am – 5.00 pm Monday to Friday, and from the club shop in the days leading up to the match. As there are lots of seating options and three categories of matches the above ticket price are only an approximation. Remaining tickets are then made available to purchase on matchdays from the ticket booths located in the east and west grandstands. Swedbank Stadion sits 3.1 km south of Malmö city centre with the resulting journey likely to take the average football fan around 40 minutes by foot or 15 minutes by bike although many choose to take the bus. Swedbank Stadion has a unique appearance to the slanted nature of the exterior cladding which gives the ground an angular aesthetic rather than a soft curves which are more familiar. Parking at Swedbank Stadium is strictly off limits for the general public on matchdays which means if you wish to travel by car then take a taxi! From Malmö Central Station you can catch number 3 which is more or less a direct service to Swedbank Stadion. Failing this you could try bus numbers 6, 7 and 34 which also drop you off within walking distance of Malmo FF’s ground. Although there are a handful of railway stations in the city Malmö Central Station is the largest. It is here where you can not only catch regional trains to the rest of Sweden but inter rail services to destinations around Europe such as Copenhagen and Berlin. It’s hard to take a bad picture of most public buildings in Europe! This is Malmo’s Central Station. The city is predominantly served by Malmö Airport however Copenhagen Airport in Demark is a feasible option thanks to the bridge which makes the it less than 35 minutes away by car. Malmö airport is connected to the city via a train service which takes 20 minutes. The nearest hotel is undoubtedly Mercure Hotel which is less than five minutes south-east of along Stadiongatan. The remaining accommodation options lie back within Malmo city centre where you will find a varied range including the likes of Radisson Blu, Best Western and Comfort Hotels.